It’s Tax Day. If you’ve procrastinated, there are some things you should know. 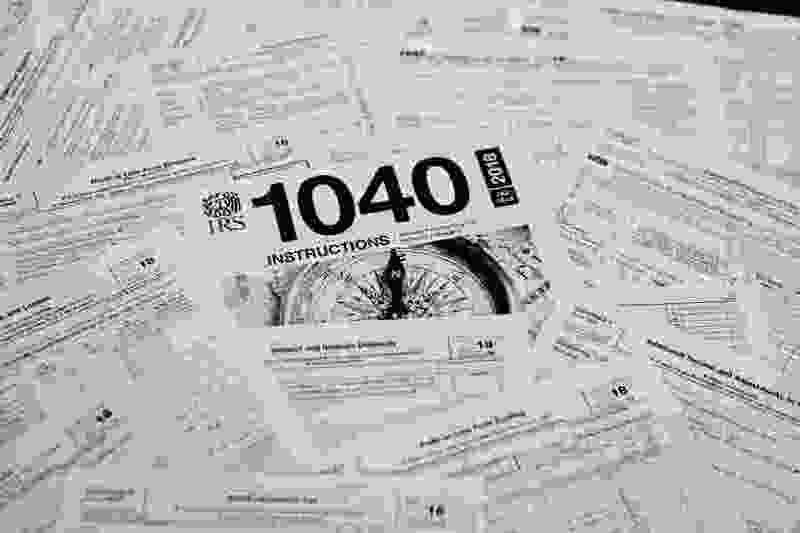 (Keith Srakocic | AP file photo) This Feb. 13, 2019, photo shows multiple forms printed from the Internal Revenue Service web page that are used for 2018 U.S. federal tax returns. Monday is Tax Day, offering plenty of chances for agony and ecstasy. Some merchants offer deals or freebies to ease the pain. Taxpayer groups perhaps increase misery with reports showing just how long it takes to work off tax bills. And the U.S. Postal Service urges care in filing to avoid penalties. Income tax returns are due by midnight if filed online and require a Monday postmark if filed by mail. Filers may obtain an automatic extension, if needed, by filing for one by the deadline. The U.S. Postal Service no longer offers extended hours on Tax Day. But it notes that 31 Utah post offices have self-service kiosks that are open 24 hours a day. Customers who print a mailing label before midnight at a kiosk will receive an April 15 postmark. If you are expecting a big tax refund because of the much-touted tax reform Republicans passed in 2017, you might be in for a big, disappointing surprise. Taxpayers and tax preparers have reported many Utahns are receiving smaller federal refunds than anticipated and, in many cases, are learning that they owe the state. The Tax Foundation, an independent tax policy research group, each year figures out when “Tax Freedom Day” arrives. That is when the nation as a whole has earned enough money to pay its tax bill for the year for all federal, state and local taxes. This year, it falls on Tuesday, April 16, the day after Tax Day, and 105 days into the year. But some good news: Tax Freedom Day in Utah came a bit quicker, and fell on April 11, thanks to lower than average state and local taxes here. Oklahoma has the nation’s earliest Tax Freedom Day on March 30, and New York has the latest on May 3. But here’s some worse news: The nation borrows more than $1 trillion a year to cover its spending. If that annual borrowing were included, the national Tax Freedom Day would occur on May 8. The Tax Foundation notes that America will spend more on taxes this year than it will on food, clothing and housing — combined. Meanwhile, the National Priorities Project (NPP), a group seeking transparency for the federal budget, released a breakdown of how the federal government spent tax dollars in 2018. “The average taxpayer paid the same amount ($101) for K-12 education [in federal taxes] as they did for Immigration and Customs Enforcement (ICE) and Customs and Border Patrol, including family separations,” it said. The group also said that out of every $1 of federal income tax spent in 2018, 29.6 cents went to health programs like Medicare, 24 cents went to the military, 15.8 cents went to interest on the federal debt, 7 cents went to unemployment and labor, and 5.9 cents went to veterans’ benefits. A recent report by the Institute on Taxation and Economic Policy says low- and middle-income Utahns pay an overall effective tax rate that is higher than the rate paid by upper-income residents for state and local taxes. For example, the top 1 percent of Utah income earners pay 6.7 percent of their income to state and local taxes, while the bottom 20 percent pay 7.5 percent, and the middle 20 percent of earners pay 8.8 percent. 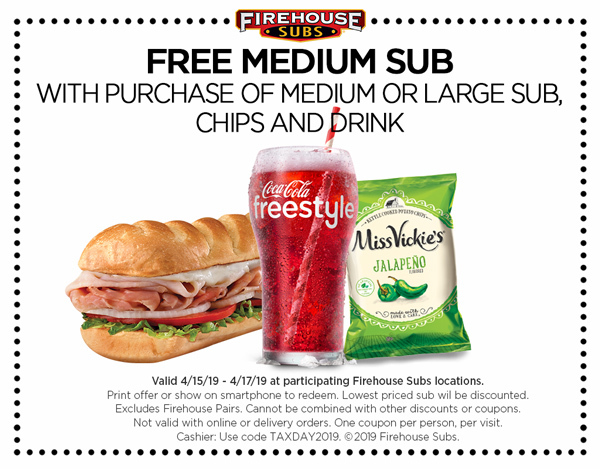 • Firehouse Subs offers a free medium sub with the purchase of a medium or large sub, chips and drinks from April 15 to 17, with a coupon. • Schlotzsky’s is offering one free small The Original sandwich with the purchase of a medium-sized drink and chips. • Office Depot/Office Max offer free shredding of up to five pounds of documents with a coupon. • Hotwire.com is offering $15 off $150 Hot Rate hotel deals from April 11 to 16 by using promo code TAXGETAWAY15 when booking. • The National Park Service offers free entry to parks and monuments on the Saturday after Tax Day, April 20. It is technically to celebrate the first day of National Park Week.